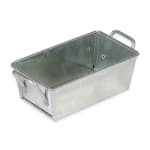 The American Metalcraft GSP35 sugar packet holder is made with galvanized steel for durability; this material also gives tabletops a rustic look and feel. Its rectangular shape is perfect for holding packets of sugar for your diners’ coffee and tea. The American Metalcraft GSP35 sugar packet holder can also accommodate ketchup, mustard, and mayonnaise packets.